3rd Avenue. That car’s not helping, is it? We called for bus lanes on 3rd last fall and with the buses coming out of the tunnel it’s a great time to make another push. 3rd Avenue is an intensely busy bus corridor. The city would deem it unacceptable if tens of thousands of train riders were slowed by cars every day. The same reasoning ought to apply to bus riders. That bike in the picture is probably doing even more damage than the car. I really don’t get why people ride on third instead of the bike lanes on second. I personally use the 2nd Ave cycle way, and used 1st Ave to get to Sodo before Carmageddon for the same reason people use 3rd: it’s faster because you don’t don’t get caught by the protected left turns for cars. I’d rather risk my life with bus drivers than car drivers. I’ve noticed on nearly every southbound commute on 2nd Ave (I go from Bell to Yesler) at least one person driving a car makes the left turn on red. On the northbound commute (Yesler to Blanchard), people driving cars are usually blocking the box and stationary in the crosswalk while bikes/pedestrians have the right of way. 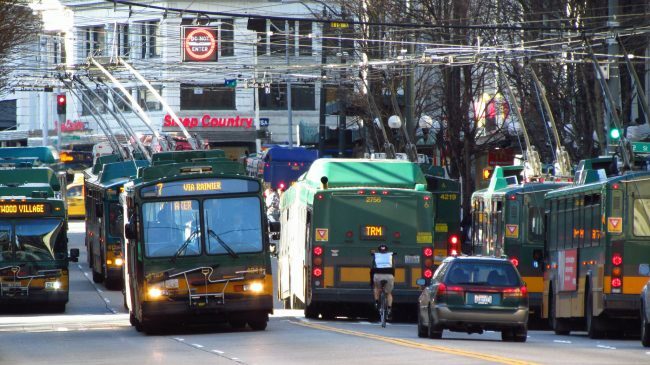 Back to the topic of this post, I agree the 3rd Ave bus boulevard needs to be extended to Denny. What? Does he have studded tires? Note that on 3rd the cyclist is biking with traffic. If he were on the 2nd ave. bike lane he would be biking against traffic which is extremely dangerous. While Chicago and every other city that wrongly installed contra flow bike lanes are removing them Seattle keeps adding them on despite the proven danger to cyclists. So (A) move the northbound protected bike lane to 4th and (B) expand bus only to Denny. Why do cars drive on 6th when they could drive on 4th? Maybe the bicyclist is going to a business on 3rd Avenue. Maybe they don’t know about the 2nd Avenue cycletrack. The cycletrack is separated fromm the car lanes by a row of sticks and hopefully a more significant barrier in the future. Of course cars can smash through the row of sticks and into the bike lane, but at the same time they can roll onto the sidewalk, and does that mean people shouldn’t walk and bike on sidewalks? And it’s not illegally riding against traffic because the cycletrack is there, and it’s reasonable to assume the city authorized the cycletrack. Just returned from Basel, Switzerland where almost every major street had exclusive lanes for streetcars, buses and bikes only. By removing cars from the picture (they can’t drive through most of their downtown or it’s so inconvenient/expensive it’s not worth it), bikes, streetcars and buses interact much more amicably. It’s because our city is doing everything possible to accommodate cars that we have to invest in “expensive” protected bike lanes and paint the bus lanes and etc. Banning cars downtown would not only create a more livable, vibrant city but it would save us lots of $ from not having to create exclusive and protected lanes for other modes of transit. I agree. It makes sense to extend the bus lanes to Denny, since that is where Third Avenue ends. Belltown is every bit a part of downtown as anywhere else, and the streets that run through it should reflect that (by having bus lanes). And if upper 3rd Avenue is critical enough for off-board payment, shouldn’t it be critical enough forbus-lane priority? And of course, part of extending the bus lane to Denny is adding a left turn for northbound buses to turn onto Denny. Currently, the buses have to cut over via Cedar St. to First for the last block, and, of course, there’s no bus lane on First. During off-peak hours, the jog over to 1st isn’t that bad, but I’m sure peak hours, it’s horrible. The cut over for northbound buses is on Broad, not Cedar. 1st does have a bus lane in the right lane NB for the stretch between Broad and Denny. Although that stretch of 1st used to be absolutely awful, for some reason (maybe retiming of signals or changing traffic patterns) it is not nearly as bad as it was 7-8 years ago. The only slowdown I see commonly is pedestrian conflicts at 1st/Broad, especially during the summer with the sculpture park attracting lots of tourists. Because most pedestrians don’t adhere to the rules of don’t walk signals, it can be difficult for buses to turn right from Broad onto 1st. Nothing to be done there, of course. A year or four ago, there was talk of SDOT adding a light for buses to make the left turn from 3rd to Denny. The timing was obnoxious, like 5+ years at the time. Anyone have any idea if that’s still in the pipeline? Hard agree. The bus only left turn from 3rd to Denny is long overdue. this suggestion seems solid. there are risks elsewhere. the arterials at either end of the 3rd Avenue transit spine are critical as well, and may break down with the higher traffic and bus volumes at peak hours. Consider the red paint on Battery Street; one violating car can jam many outbound buses. Consider the two blocks of 4th Avenue South between South Jackson and Washington streets; will it jam in the peak? Consider Pike Street; Murray-Kubly took a lane last fall; in March there will several patterns of buses and more volume; will it jam? 2nd and 4th avenues? for many months, the Aurora Avenue North routes have one lane between Harrison Street and Denny Way. The city would deem it unacceptable if tens of thousands of train riders were slowed by cars every day. The same reasoning ought to apply to bus riders. Didn’t we pay for a bus tunnel to prevent this from happening? Seems like ST should be on the hook to build a new one. You do realize people actual live on 3rd in Belltown and new buildings are underway and planned? There are parking garages, deliveries, loading zones and many spaces for residents and merchants. Further, the impact from private vehicles is virtually nil on 3rd north of Virginia; a much larger impact is bus drivers driving down the center of 3rd instead of their lane. Belltown is not Downtown, don’t confuse the two.